WD has just announced the expansion of its award-winning WD Red Pro hard drive line with the release of 5 TB and 6 TB capacities. The WD Red Pro family is ideal for NAS (network attached storage) systems having up to 16 drive bays and serving businesses with more expansive storage needs than the standard WD Red drives. Shipping now, WD Red Pro 5 and 6 TB drives leverage an enhanced design and 128 MB cache to deliver data transfer rates of 214 megabytes per second (MB/s). WD’s NASware 3.0 features technology promoting data protection, high NAS performance and reliable integration. Up to 16 Bay Shock Protection – Equipped with a multi- axis shock sensor, the drive automatically detects subtle shock events and, along with dynamic fly height technology, adjusts each read-write function to compensate and protect the data, further protecting the drive in large 1- to 16-bay NAS environments. NASware 3.0 – Exclusive advanced firmware enables seamless integration, robust data protection and optimal performance for systems operating in the demanding NAS environment. Vibration Protection – Hardware vibration compensation technology monitors the drive to correct both linear and rotational vibration in real time, further increasing drive reliability and enabling high performance in higher vibration systems caused from drive to drive vibration as well as from the high speed fans used to cool the larger systems. Longer Warranty Coverage – Complimenting WD Red drives at a 3-year limited warranty, WD Red Pro offers longer warranty coverage with a 5-year limited warranty. Available now at selected retailers and resellers and are distributed by Iontech, Inc. and Ubertech Technologies, Inc.in Philippines, WD Red Pro has a five-year limited regional warranty. 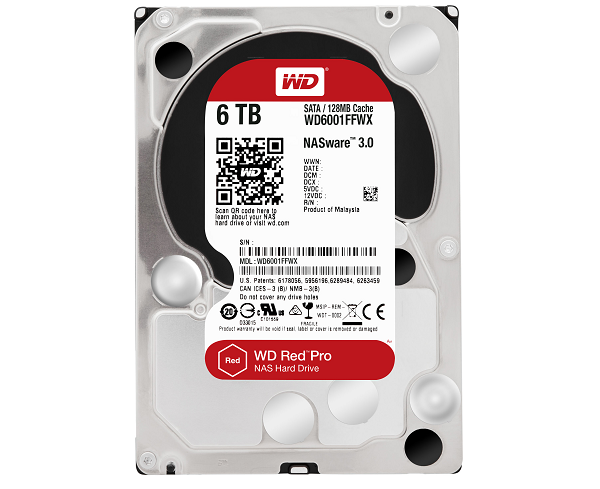 Manufacturer's suggested retail price (MSRP) for WD Red Pro 5 TB is Php14,200 and Php15,800 for 6 TB.